The 585 YTMC Meeting was held Dec. 6 at Seishounen Ikusei Center. 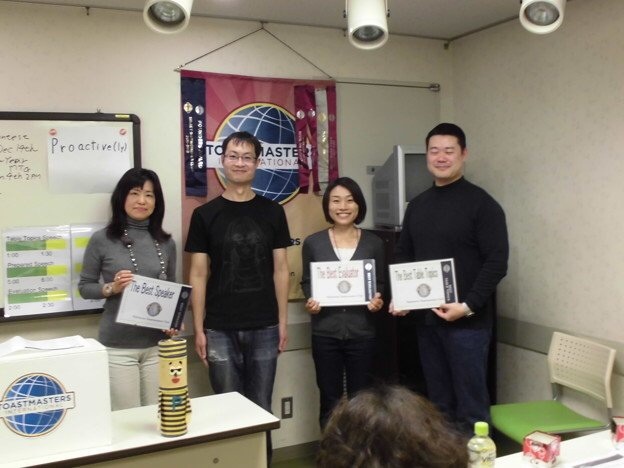 We had one gest from other Toastmaster Club. At the Joke session, I laughed lots and almost every member. There were 4 prepared speakers. some comments to the speaker. The meeting ran soothly and kept good time management. Thank you very much, all role takers !!! I think this meeting too was successful and fruitful. 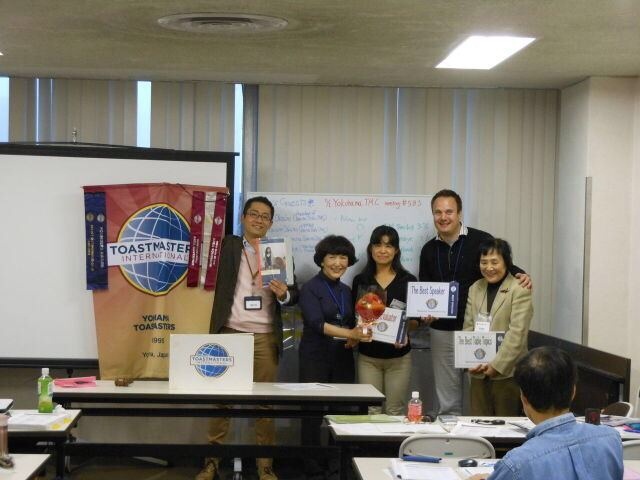 President A.T adjourned the 585 meeting of Yokohama Toastmaster club on time. Thank you for joining our regular meeting. I think, it became really fruitful meeting. Toastmasters’ regular meeting, and report of District 76 Conference. Many contents were there, but meeting was adjourned at 4 o’clock. 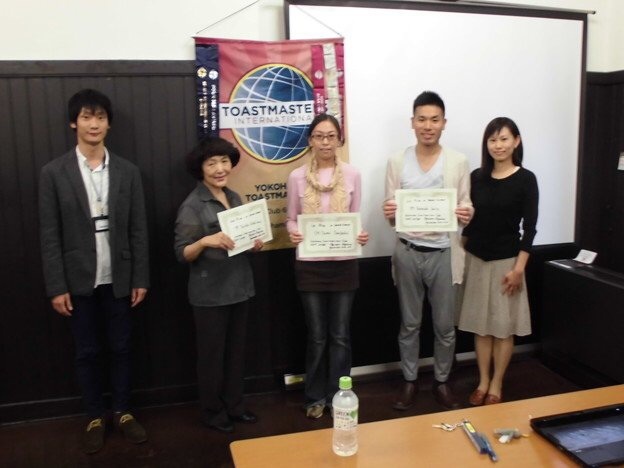 I found a great thing that Toastmaster of the Day is the best way to enjoy each member’s speech. Since I took a forward seat in the room than other audience, I could savor each speech more deeply. After accepting to be TMOD, I deeply regretted my “Yes”. Being a poor PC user, it seemed difficult for me to write the agenda and send it to members. However TM S’ s great support, I could accomplish my role. 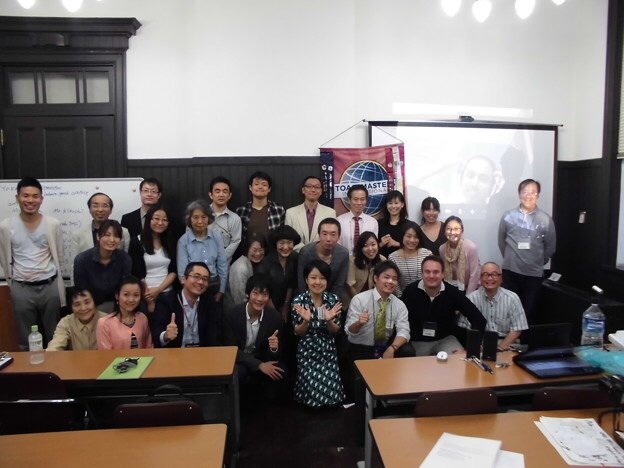 The YTMC #582 meeting was held on Oct 18th at Free-Flat-Nogeyama with 17 members and 2 guests. I (TM K.T) enjoyed doing TMOD role today!! The meeting started with opening remark by our President TM Taketomi. During Business session, he informed the result of In-House Contest and Area 42 Contest. After that, TM M.H accepted to take a vacant role, which was Word of the Day and Gracho role as volunteer. Thank you for your kind support! Today’s Word of The Day represented by TM M.H was ‘wonderful’. I really liked this word! Timers were our new member TM Y.S and M.Y and Vote Counter was also our new member, TM W.Y. Even though, it was a very first time and first role for them, they did their job very well! Today’s Tips Master was TM S.I. He introduced one interesting article from Toastmaster magazine September Edition. And also, he encouraged our members to read the magazine. Today’s Joke Master was TM T.N and he challenged to introduce some American Joke. Some of them were difficult to understand for our Japanese. It means the point of Laugh is very different by each country. Table Topic Session was conducted by TM T.T. She gave us very unique and seasonal questions such as autumn and sports. We enjoyed her questions and listening to the answers of Topic masters. Today, there are 3 Speakers and 1st speaker was our new member TM M.O. She did a great job as Ice Breaker!! During her speech, she introduced the background of her life in China and Japan and her future vision etc. Congratulation to complete her very first speech as TM! Second Speaker, TM R.K made a speech about his experiences in Special Committee on Disasters in his company. There were many useful information and messages his speech. Last speaker was TM S.I. The title ‘I love Whisky’ and he started with his body language by drinking Whisky. We all laughed and enjoyed his humorous and unique speech very much. We also learned the history of Japanese Whisky which nobody knew. I felt that Japanese Whisky has very interesting and dramatic history in the past. We had a special Work Shop session by TM T.S. He made a presentation about how to resolve the conflict with using Power Point slides. The visual aid was very supported and easy to understand his message. Today’s General Evaluator was our President TM A.T and at the beginning of GE Session, he informed us that the evaluation is the most important part of toastmaster’s activities. With evaluation, we can know what we need to improve, what is our given strength and characters. 3 evaluators (TM M.T, TM T.S, TM N.S) made wonderful evaluation for each speakers according to the manual. Especially, the evaluation for CC#1 Ice Break Speech is very difficult in a way but TM M.T, he did great job! TMOD(I, TM K.T) conducted the award session. Best T.Topic Speaker was TM W.Y, Best Evaluator was TM T.S and Best Speaker was TM M.O. 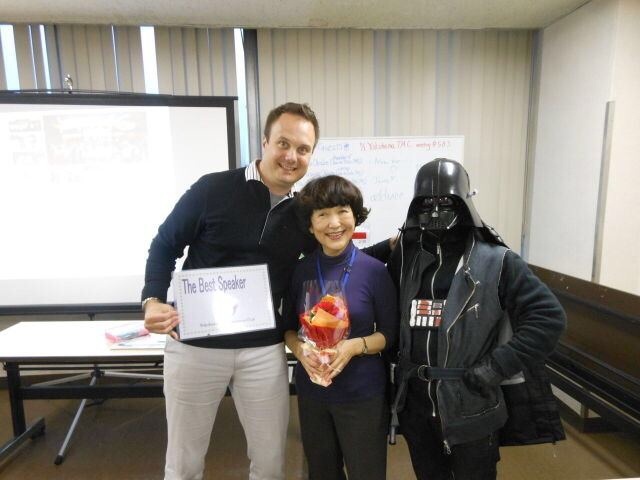 Best T.Topic Speaker was TM W.Y and Best Speaker was TM M.O.are very new member!! Congratulation! During the meeting, many members use ‘Word of the day’, ‘Wonderful’ !! The word made us feel happy! All role takers thank you so much for all your great support!! I really appreciate your kindness. I believed that not only TM members but also 2 guests enjoyed today’s meeting. Please come and join our meeting next time. Thank you!! Thank all YTMC members, for giving me an opportunity of TMOD. It was my first experience of particular role. I try to help this to business. It was my first time to take a Contest Chair in TM activities. I have been joining the contest as a contestant for 3 years. Then I focused on making my speech and enjoyed giving the speech to members. However I had to manage YTMC In-house Contest at this time. My priority was to collect many contestants. And I needed to create the stage that contestants give each speech with a good feeling. I felt that I gave my speech comfortably because Contest Chair created the stage for me. 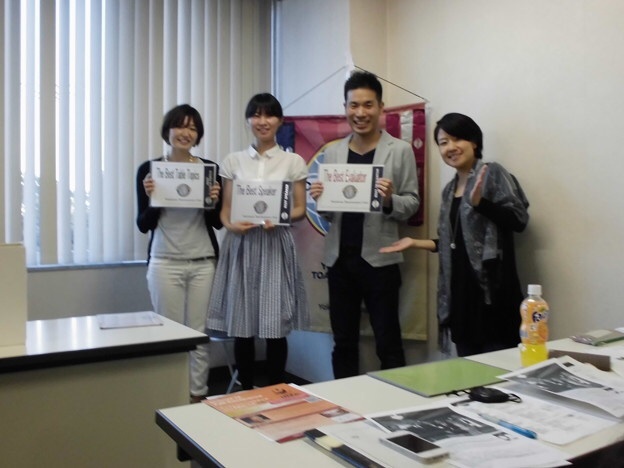 As a result there were 10 contestants in English and Japanese Contest!! I thought our In-house Contest in2014 was successful. But success couldn’t come without member’s cooperation! I really appreciated all members, and all contestants! Thank you very much! Lastly I announce prize winners of our In-house contest in2014 at both contests!! The YTMC #579 Meeting was held close to Nogeyama Park at the Seishonen Kouryu Centre. It was a hot day and summer was back with a last weekend of hot weather. To my delight and maybe because we had a huge venue reserved, almost 30 people were able to make it and enjoy my first TMOD session. However I believe they were really coming for the Speech Marathon and especially for TM Y’s presentation on the “Road to DTM”. The schedule was tight so we omitted a theme for this meeting. The word of the day ultimate was used well throughout ultimately enhancing the atmosphere of the meeting. We managed to keep the time fairly well giving us the opportunity to hear 4 Table Topic Speakers give wonderful short speeches. This was followed by quickly moving into the Speech Sessions containing 6 Speeches with a wide variety of topics. 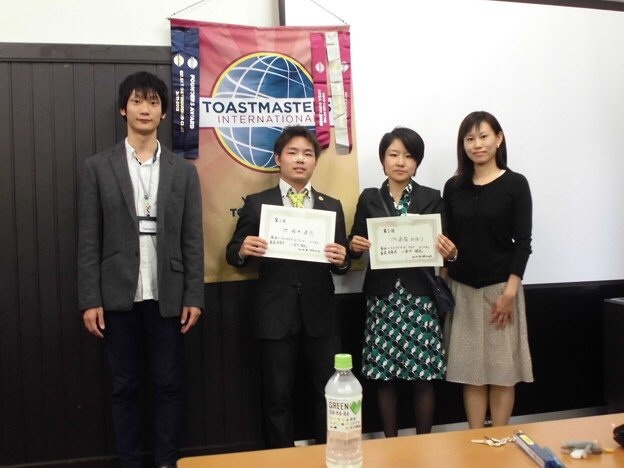 First we were introduced to one of our recent new members via her Icebreaker Speech, then we moved to the beauty of Himeji Castle before taking a turn towards the Humorous side with speeches about Unusual Signboards, Primate Humor and great information about the Fall Speech Contest! After a very brief intermission, it was our treat to have TM T.Y present his experiences/expertise on “The Road to DTM”. He broke us into workgroups and gave us questions to present later. Each group could quickly list down answers and present to the greater audience. TM T.Ythen elaborated on the answers given and gave a great overview on the baby steps required to reach the final goal of DTM. Thank you TM T.Yfor your presentation. We wrapped up the meeting with a quick Evaluation Session and our President/VPE reminded everyone of the upcoming Fall In-House Humorous Speech Contest. It was a great first experience as a TMOD and I look forward to doing it again, this time with a theme!